.tornadoes. I don't know if you have heard about the numerous tornadoes that went through Wisconsin last week or not. When I usually see some sort of natural disaster I say a quick prayer and move on. Unless it is big like Haiti, or Japan. 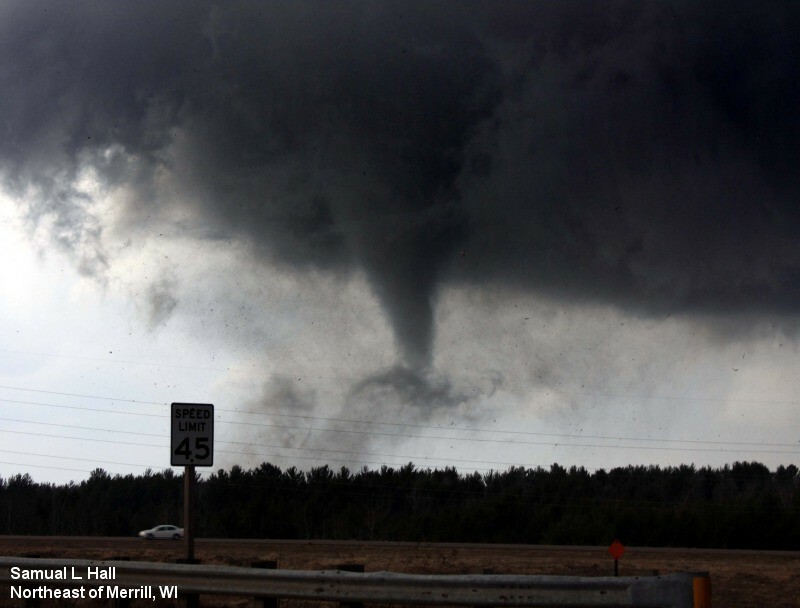 However, the tornadoes in Wisconsin over the weekend hit home because they went through my grandparents (both sides, and much of my extended family as well) home town, Merrill, WI. According to this article, the tornado was an F-3 and tracked for 22 miles before it disappeared. It did most of its damage along the north side of Merrill around the airport. My grandparents live directly along the airport fence and missed the biggest damage by less then a half mile. They were extremely lucky that they only had two trees in their yard fall. Most of their neighborhood is gone. My grandpa stated that, "it looks like a war zone".... and that comes from a man who served in the Korean war. My uncle and aunt's house got hit, they were lucky and had only partial damage to their home. It makes me realize how extremely blessed my family is that no one got injured. I will be thanking the Lord a long time for their safety. They could have easily been this man - who lives right down the road. The tornado also shows me how everything we own can be taken away in the blink of an eye. And it makes me thankful that I do not put my trust and security in my things, but rather Christ. .tornadoes. Wow, I am so happy to hear that your family is ok! My grandparents, great grandparents, uncle, aunt, and cousins, all live just a few minutes a way from Merrill. My Grandpa said he could actually hear the tornado! Crazy! What a devastating storm to many! Prayers are with them.